As a student now residing in the Silicon Valley, I constantly hear about new technological innovations, smartphone apps, and other ways that tech-savvy people are making everyday life easier and more manageable for the general public. This past weekend, I enjoyed a day trip to San Francisco to visit a couple of friends at a nearby school. While in the city, I noticed a number of cars with giant, furry pink mustaches on their dashboards. I asked my friends about these cars and their eccentric accessory, wondering if this was some sort of fad I had missed. It turns out that these cars are actually part of a company known as Lyft. Lyft was started in the summer of 2012 by co-founders Logan Green and John Zimmer in San Francisco as a way of making transportation easier for people in the city. It is the most recent product of the hugely successful parent company, Zimride, which was started in 2007 and has closed about $7.5 million in funding. The smartphone application uses GPS to track the customer’s current location and then acts as a sort of cab service. It then reveals the closest Lyft driver in the area with an estimate of how far away his or her vehicle is. There is no need to pay the driver once you are in the car, as you register for the account with your credit card information. The money is charged straight to your account, with the tip included. The suggested donation is approximately 30 percent less than a cab fare. After you request a ride, you can check the driver’s rating, which is an average of previous customers’ ratings out of a possible five stars. You may also view a photo of your driver and of his or her car. Typically, the first thing customers will notice and comment later on upon entering the car is the friendliness of the driver, who welcomes the guests with fist bumps (a key part of the Lyft experience). Lyft drivers must be at least 23 years old, have had a driver’s license for more than three years, and pass background checks and DMV checks, according to this CNN article. 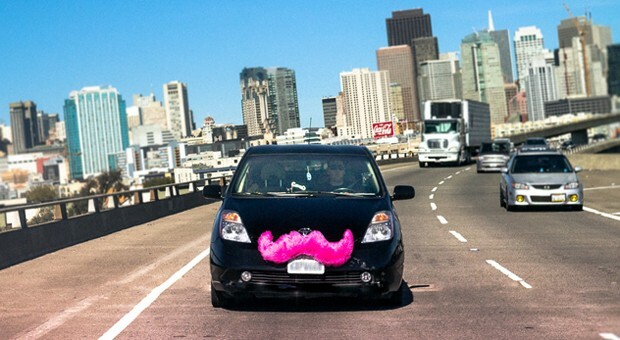 As of August 2013, Lyft expanded to Los Angeles, San Diego, Boston, Chicago, Seattle, and Washington, D.C. According to recent posts on the company’s blog, it has continued to launch in a growing number of cities across the U.S.
1) Originality. A pink mustache on a car is not something you see every day. It is catchy, immediately grabbing your attention – a key marketing strategy. 2) Simplicity. The app is extremely easy to use, and the Lyft process is uncomplicated, safe, and reliable. The driver arrives to pick you up in a matter of minutes, and he or she is sure to take you to your destination. 3) Customer service. This may seem obvious, but Lyft takes customer service to a new level. Any driver averaging less than a 4.5 rating is dropped from the company, according to this Economist article. Lyft drivers not only make life easier for travelers who need transportation from one place to the next; they also do their best to make the experience enjoyable. Of course, the idea of a random person driving you in their vehicle could be a bit sketchy, and I personally would avoid requesting a Lyft ride unless I was with other people. My point, however, is simply to point out the uniqueness of this Bay Area startup and some potential reasons for its success. If you have any thoughts on Lyft or have heard about another new and exciting start-up, questions and comments are always welcome! Marketing on LinkedIn Are prospective advertisers calling you?